Is the U.S. dollar safe? Since the Bretton-Woods Agreement of 1947, the U.S. dollar has been viewed by many as the world's strongest currency. and serves as the world's reserve currency. For years, it has also been acknowledged as the currency in which oil is traded on a world-wide basis. The U.S. dollar is also the official currency of East Timor, Ecuador, El Salvador, the Federated States of Micronesia, the Marshall Islands, Palau, the Caribbean Netherlands, and for banknotes, Panama. Of course, the U.S. dollar is actually nothing more than pieces of paper issued the Federal Reserve Bank. The value of the U.S. dollar has deteriorated to about only 3% of its value in 1913 prior to the organization of the Federal Reserve Bank. 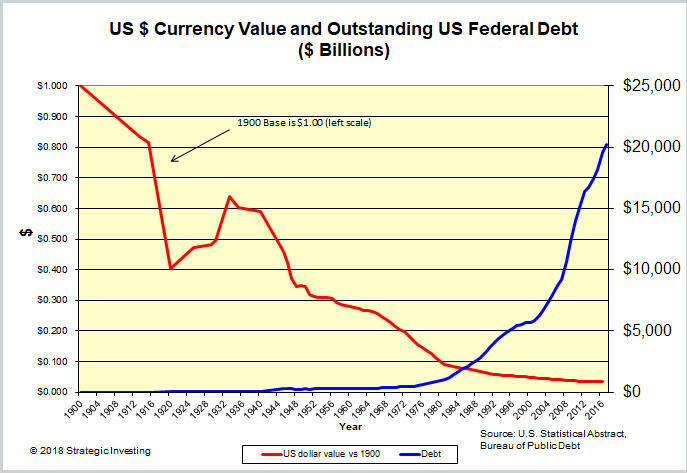 The following chart shows the relationship between the value of the U.S. dollar and the growth in the Outstanding U.S. Federal Debt on a non-GAAP basis. It is obvious that the U.S. real debt is much greater on a GAAP basis that shown above when the costs of Social Security, Medicare and other social welfare programs, etc. are included. According to the Society for Worldwide Interbank Financial Telecommunication (SWIFT), the path of RMB acceptance as an international currency can be divided into three phases—first as usage for trade, then for investment, and in the longer term, as a reserve currency. Whereas the U.S. and Europe develop strategies using a two & five year plan, the Chinese think longer term ... perhaps, 100 year plans. For the past five years, China has used currency-swap agreements to reduce its reliance on the U.S. dollar in international trade. Today, the vast majority of its trading partners have signed currency-swap agreements with China reducing the role of the U.S. dollar as a trading mechanism. The percentage of international trades that have been transacted in U.S. dollars during the past five years has diminished every year. The US dollar’s share of world trade finance fell from 85% in January 2012 to where at the end of 2017, the US share had fallen to about 60%. Before 2004, Yuan was not allowed outside of China. Since 2004, China has gradually taken steps to loosen the Yuan until today, it has become almost traded freely throughout China's trading partners. Recently, with the development of trading for gold futures in China in late 2017, the Chinese announced on March 26, 25018 that oil futures would begin trading in Yuan on the Shanghai International Energy Exchange. The world’s biggest oil buyer is now in 2018 offering Yuan-denominated futures that foreigners can buy and sell -- a first in Chinese commodities and a direct threat to the trading of oil in U.S. dollars going forward. The top nine reasons the U.S. dollar will see its role as the world's reserve currency diminish. China and Japan to uses own currencies in bilateral trade. The BRICS plan to use their own currencies when trading among themselves. China and Russia have entered in to a swap agreement for bilateral trade. African nations are settling inter-African trade in Renminbi. China and the United Arab Emirates have entered into a swap agreement. India is using gold to purchase crude oil from Iran. Saudi Arabia will abandon the petrodollar in transactions with China. >The United Nations continues to advocate for a new world's reserve currency. The IMF has changed the percentage of the U.S. dollar in its Special Drawing Rights (SDR) currency basket to include the Renminbi. Since its peak in 1985, the U.S. dollar index has traded with a downward bias as shown below. Since making its historic low in 2008, the U.S. dollar index has managed to rally moving above the long-term trend line but recent movement suggests a degree of uncertainty about the future direction. a significant difficult increase in financing existing debt. Will the U.S. dollar find a Minsky moment in the near future? Only the "man behind the curtain" knows. Under the right conditions, the recent strength in the U.S. dollar could disappear in a flash. Rather, it should be obvious to the prudent investor that things are changing and over the past five years, significant progress has occurred towards reducing the U.S. role as the world's reserve currency. Perhaps, the portfolio should have an allotment for foreign-dominated assets. This issue of 'Tis Only My Opinion was copyrighted by Strategic Investing in 2018.